I bought the DVD here a couple of months ago, but to date have only seen small portions of it due to child interuptions. Of what I did see, I loved Meryl Streeps Julia Childs interpretation, and she is certainly an interesting character. It did inspire me to buy Julia Powell's second book, 'Cleaving', where she trains to become a butcher. By half way through I was struggling with it because I just didn't like her at all as a person. Butchery isn't exactly that exciting a topic, but primarily the brazen account of her affair and her failing marriage just made me feel terribly sorry for the other people involved (primarily her husband) who would have to put up with seeing it all in print. I, too, felt annoyed at Julie Powell's affair, but it was such an aside as I was totally mesmerized with Julia herself. My gourmet cook daughter and I saw it in the the theater soon after it came out, and if it hadn't been so late we would have gone home and made bruschetta for a midnight snack. I waited until the next day instead and made it just like Julia did. YUMMMMMM! 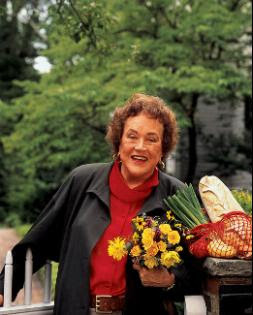 Oh, I'm dying to read Julia Child's books (I kind of can't believe I haven't yet). I think you may have given me inspiration for a Christmas present request!